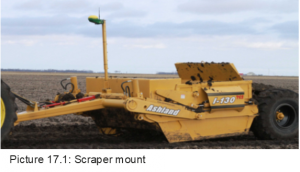 The GPS antenna needs to be mounted directly above the scraper blade or plow tip. It should move 1:1 with the blade or tip. It should be mounted high enough to acquire signal above the tractor (3-6 foot mast is recommended). Scraper: Picture 17.1. 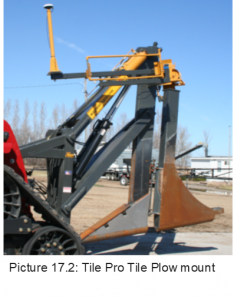 Tile Plow: Picture 17.2. Make sure the GPS cord running back to the tractor from the antenna is attached securely and not hanging loose. Check that there is enough slack in the line for the movement of the implement and turning of the tractor.